The Harbour Club situated at the Grand Harbour in Malta is a beautiful restaurant in a simply stunning location. A carefully converted warehouse is where The Harbour Club is hosted, with both an indoor dining area and an outdoor terrace, The Harbour Club serves Mediterranean dishes with a French influence. 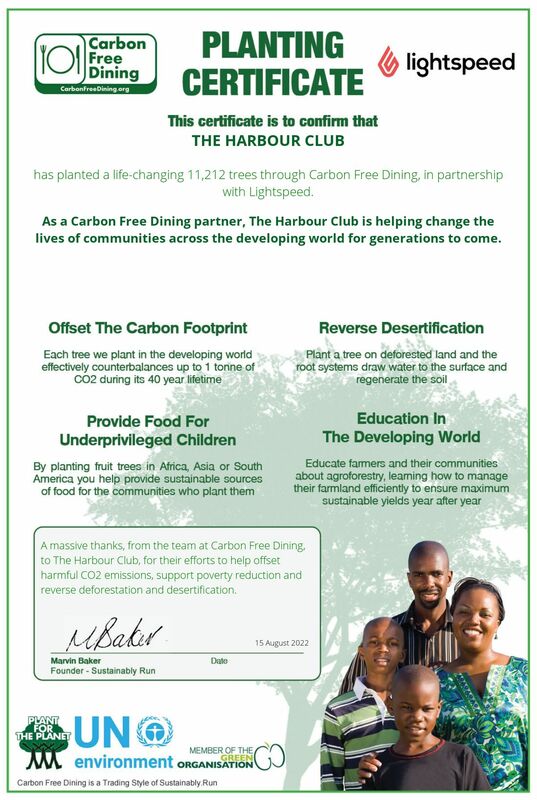 The Harbour Club Malta has teamed up with Carbon Free Dining, the United Nations-backed Restaurant initiative. They have chosen to demonstrate their love for the environment by partnering with the programme. As a Carbon Free Dining Certified restaurant, The Harbour Club Malta plants hundreds of trees each month, effectively offsetting the Carbon Footprint of the meals it serves. This is done by simply giving diners the opportunity of planting a single fruit tree with each bill for an optional 99p.